A chance encounter 7 years – changed how I view the impossible. I ran into Russell Kirsch – the creator of the first programmable computer and the pixel (you’re welcome digital photography). You can read the full story here, but he left me with a quote and an insight about Apple that I didn’t understand right away. I didn’t know who he was at first. 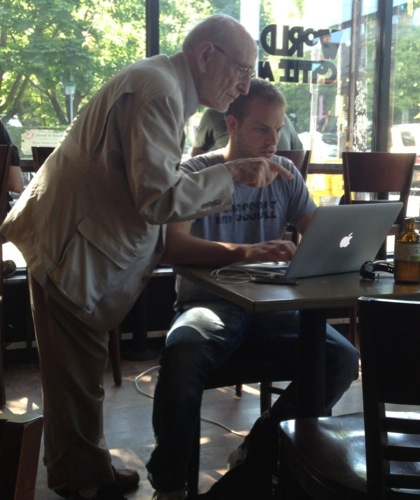 Just an older man at the coffee shop asking me if I liked Apple. I didn’t realize till the middle of our conversation who he was and his contributions to the world, but I was blown away both by his accomplishments and by what he was saying. I mean, everyone loves Apple, right? And now, 7 years later – it’s almost uncanny about how Russell seems to be right. Apple’s product launches used to be about game changing technology. Creating amazing software that let you make things. You bought the hardware so you got access to the software. It was a beautiful software company and they were always launching new products and tools to make new things. But right around the time I ran into Russell – things started to change – and he could see it coming – even if I didn’t understand it. …when people use iPads they end up just using technology to consume things instead of making things. To be clear – I love Apple. I’ve used it since college and almost bought a PowerBook right before the “MacBook” line was released. It’s the only computer I owned as an adult. In fact, I’m writing this on a Mac right now. And it’s important to remember a computer is just a tool. And what you do with it is a choice – you can choose to consume or you can decide to create something. But you have to choose. That’s the problem with a lot of people. They don’t try to do stuff that’s never been done before, so they never do anything, but if they try to do it, they find out there’s lots of things they can do that have never been done before. Because with a computer, you don’t have to just get sucked into consuming. You can make things, you can create things that have never before existed. You can do things that have never been done before. So go ahead, and actually do it. Join the discussion on Hacker News here. I love this!!! I couldnt agree more. I travel fulltime and often times find people that just follow the pack of what they are supposed to do. No one is original. I love to live in places longer than usual and find random things for work or really just simply try things Ive always wanted to do. As a woman that has lead me into some of the weirdest jobs but it has made me completely adaptable and versatile as a job seeker. Being able to think critically about an idea and optimistically about any job because you get to learn something new is a great way to develop yourself. While I agree that Apple has lost its way somewhat, I know that it will come back. And most people misuse the iPad as just a consumption device. It is a great tool for cration as well. I use mine to write scripts for my videos. I then use it as a teleprompter display. I also use it to edit my website, create graphics, and update social media on what I do (which is design and build tiny satellites, BTW). Any tool can be used to create, if you have the vision to use it as such. What is lacking is a lot of vision. Apple may have lost its way, but so have many people. The impossible is only impossible until someone has done it. I SO agree…every time i read another Apple product with PLUS in it I hear Jobs banging his head on his coffin. I know I’m paraphrasing Buffet but to me what he said to Apple was ” Stop playing catch up, get back to leading. Take some chances. If you cant afford it now then when?